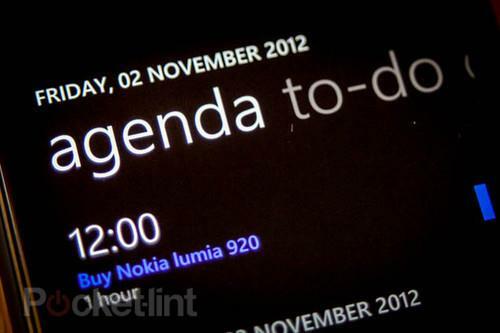 Nokia has confirmed to Pocket-lint that the Nokia Lumia 920 will be available in store in the UK on the 2 November contrary to dates previously published by both the exclusive operator, EE, and Microsoft. The new phone will be available in Red, Yellow, Black, and White, in all EE stores on Friday 2 November, with the Lumia 820 following 7 days later and arriving on the 9 November. EE and Microsoft had both independently told Pocket-lint that the Lumia 920 would originally be on sale on the 9 November, however Nokia has now said that the phone would be available earlier. You'll be able to pick up the new 4.5-inch Nokia handset, which comes with the 8-megapixel PureView camera, for £49.99, on a £41 a month EE contract. That contract will give you 1GB of 4G data a month, unlimited calls and messages. READ: What's new in Windows Phone 8? If it's Windows Phone 8 you're interested in, you'll also be able to get the Nokia Lumia 820 on EE, with the HTC 8S and HTC 8X available on Orange and T-Mobile contracts. Nokia has also confirmed that the Lumia 820 will come with the wireless back cover in the box for free, something that it previously said wasn't the case.